Often bought without trying on the shirt is great. If you exchange the purchased item impossible, it remains one option – to take in a shirt, to fit it on the figure. Many expensive stores have this service. If the same thing bought in a regular store, you can give it in the Studio, where professionals will be able to perform this procedure. But if you can sew, you can try to take it yourself. First, turn your shirt inside out and put on the one who will wear it. Then popliteus neatly with pins so that it is "sat". You need to fix the pins sleeves, side seams, raise the shoulder line. Sometimes you need to shorten the sleeve. Carefully so the pins don't fall out, remove the thing, put it on a flat surface and carefully measure how much and where to pin. If, for example, the left side seam pinned 2 cm, right 3, then both sides need to reduce the width of 2.5 centimeters. Then record all final measurements. Now you need to rip the shirt along the side seams, and shoulder. It should also be flogged, and to rip the sleeve. If you need to shorten the sleeve, then uplift the cuff, trim the necessary amount of tissue and again protocide her. Sometimes it's fairly easy to alter the buttons on the cuff, if sleeve is not very long and wide. Cut the amount of fabric at the side seams. Almost always when this operation is required to reduce the shoulder length. Observing the data of their measurements, cut the necessary number of centimeters. Armhole sleeves will change, so the greatest challenge will be to carefully sew the new armhole sleeve. It is usually sutured on the same number of inches, and armhole. Be careful that the fabric does not pucker and does not interfere with the movements. When it's sour cream and again arrange a fitting. You must make sure that the shirt is easy to lift and lower the arm that it is not crowded, and everything is symmetrical. If necessary, make changes, and then try again. When everything is correct, sour cream and prostrochite fabric, connecting all the parts. 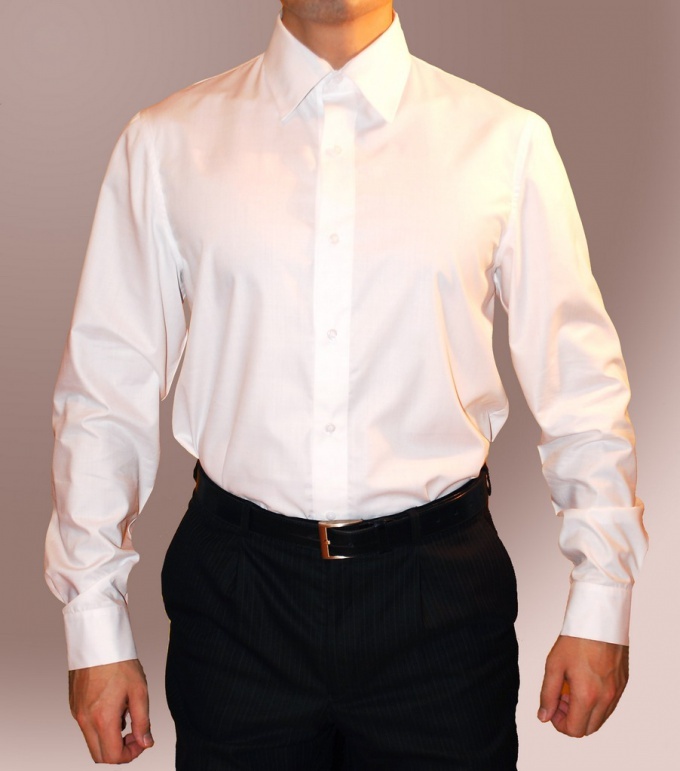 Stirring by shirts is a time – consuming process that requires attention and specific skills of sewing. If you are unsure of your ability, better to give the shirt to the Studio. Sometimes a long sleeve shirt can be very hard to interrupt. In this case, you need to tame it to the elbow. It's not necessary to go to the Studio. You can easily do the job at home. To shorten the sleeves of a shirt is quite simple. Because it has no padding like a jacket. You will need thread, safety pins, sewing machine, scissors. To begin, you must determine the new length sleeve. To do this, put on your shirt and stand in front of a mirror. Fold the sleeve as far as necessary. Measure the excess length, or a centimeter ruler. For example, you can get extra 6 cm On the sleeve mark the level at which it is to be cut. Now fold the second sleeve. Kill safety pins length to hold it. Preen before the mirror and look at yourself from different angles. After all, you need to make sure that the length suits you. Now take off your shirt and get to work. Turn the shirt inside out and lay it on the table. Align each sleeve and how their pins at the bottom. To trim the edges exactly, however, in the same way the fabric of the sleeves. Now measure the desired distance from the edge and swipe the dotted line. Leave for allowances of 1.5 cm to 3 cm. Cut the sleeve with sharp scissors, taking account of the seam. Fold the edge of the sleeve to a distance allowance and a keen thread. After Promethea both sleeves, prostrochite seams on the machine. If you have a serger, then allowances will be enough 1,5 cm And if not, leave allowances more fabric, so will have to tuck the sleeve 2 times. Besides, can you handle the sleeves on the machine zigzag stitching. If you can not handle cropped sleeves, podhisita them twice. The distance at which you tuck the sleeves must be the same. Before you stitch the seams on the machine, put a shirt on again, and check the length of the sleeves. To mark the new length of the sleeves, use chalk or a remnant. Spend the usual dotted line. Then these lines on the fabric can easily be washed off. In order for the new ACC turned out neat and smooth, produite basted sleeves. Only then can you lay the line on the sewing machine. If you believe that a particular model of shirt machine line isn't perfect, sleeves hem a hidden seam. To do this, pass the thread a needle and make a stitch to the tucked fabric. Then grab only one or two strings on the sleeve and again make a stitch on the fabric is bent twice. So, you have a seam, which will not be visible from the front side. Double-ACC the sleeves are not appropriate if the shirt fabric is very thick.